My implementation of the Active Appearance Models (AAMs) in C++ is almost done, it is called Paamela. I am currently fixing a couple design issues and finishing up the documentation. Even though I am still not sure whether or not I will make the code open source, I thought it would be nice to share what I have developed so far, in order to help other developers working on similar problems. Paamela, my implementation of the AAMs, is based on Ian Matthews and Simon Baker’s Inverse Compositional approach. I have developed it in C++ with OpenCV 2.1, and I am really proud to say that it is very accurate and really fast! As of today, the AAMs open source implementations available on the Internet are only partly working, and their respective source codes look pretty messy to me (I can say that because I actually took the time to take a look at the source codes). I am not going to cite any project name here, because I do not want to be disrespectful to the developers who spent time implementing them. A rapid lookup in your favorite search engine will orient you, from there read the code, and make your own opinion. I am not criticizing their design choices, but the coding style, the naming conventions, and the documentation. Indeed, they are inexistent! Therefore, except for the developers themselves, no one is going to understand what the code is doing, and as a result, no one will really be able to reuse the code (which was the whole point of making it open source in the first place). The only clean open source AAMs available now is Mikkel B. Stegmann’s AAM-API, but unfortunately this is not implementing the inverse compositional approach. Since I wanted to have a clean C++ Inverse Compositional AAMs implementation, and as it was inexistent, I decided to do it myself. I have tried to make the code as clean as possible to enable other developers to understand what the different equations are doing. I have also written an API with a detailed documentation, in order to allow users to understand how to adapt it to their specific problems. The API allows users to create models based on collections of appearances, and to perform AAM fitting of input images from these models. I have also made the implementation independent from the type of data being treated, which enables Paamela to handle any kind of input data: faces, hands, bone structures, etc. Different illumination normalization techniques: HE (Histogram Equalization) and CLAHE (Contrast Limited Adaptive Histogram Equalization). Object detection to initiate the fitting process: for instance, Haar Feature-based Cascade Classifiers can be specified to roughly detect the position of the objects to fit, and enhance the accuracy of AAMs fitting tasks. Bilinear interpolation during appearance warping. Thresholded variances for the shape and the appearance statistical models. Damping for the gradient-descent update step. Support for fitting using live video through OpenCV. Multi-resolution model based on a Gaussian pyramid. For this example, I first build a model based on four different persons. 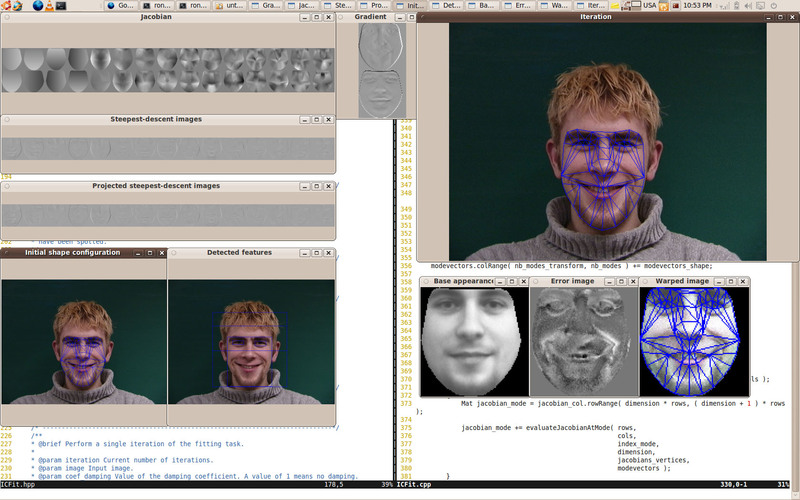 Then I am using a Haar cascade classifier to estimate the initial configuration of the face. 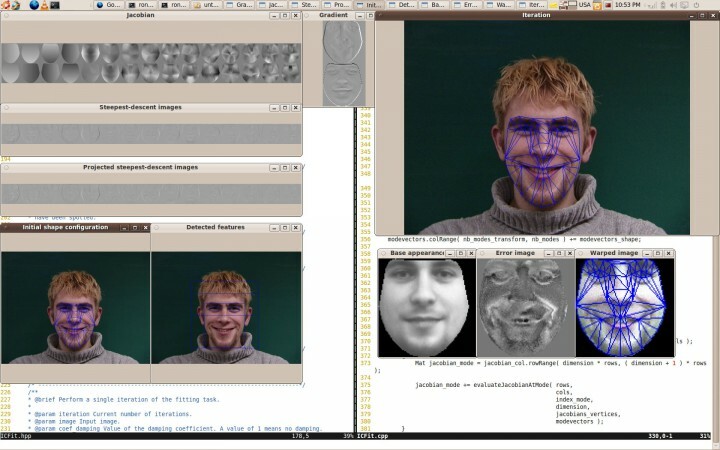 Finally, the fitting process goes on and clips the facial features in the input image. Figure 1 shows this fitting process. After only seven iterations, the fit is done, and convergence is declared after 10 iterations. If you don’t mention that…. Could I ask for a sample code on how to developed that system? How to build facial patches(mesh structures).? If you permit that, then I will very pleased . I will use only for studying . and also, I will let you know firstly, when I writing papers . I am sorry, but I am not going to make my AAM code open source any time soon. However, I recommend using Mikkel B. Stegmann’s implementation, which is open source (link given in the article). First of all well done, it looks like a great project. I am currently trying to do something very similar. I understand that you are not yet willing to distribute your code at this time, but I was hoping that you could help me get my head around AAMs. I agree with what you said above about there being very little on the web explaining this properly. I have come across a million papers, all of which are very equation heavy and hard to understand. And I have tried looking at several APIs and AAM tools, but none of which I can make any sense of. What I am really looking for is a simple break down or step by step guide on how to go about building AAMs. (I am a decent programmer so that part shouldn’t be a problem). Anyway, I hope you can help me without just referring me to Tim Coots’ website. As I said in the email I sent you, a step by step guide would be a serious time commitment, and I do not have this time right now. However, I hope that what I answered to you by email will help you. Well, I was looking forward for some open source implementation of AAM using openCV, feeling sorry that you won’t make yours public for now, though I completely understand. But do you know some other open source implementation of it using openCV ? because the one by Mikkel B. Stegmann’s is using MS, which I cannot use with Ubuntu..
I’ve been searching a lot on the web for some open source AAM code but unfortunately it was all in vain. I cannot use Stegmann’s code since I’m running OS X. Was hoping that you would accept to share your code, but just as Loai said, I also understand if you don’t. What did you use to build Paamela? OpenCV? Can you provide some hints if you don’t want to share the whole code? Vezzaro’s IC AAM implementation for Matlab, available at https://sourceforge.net/projects/icaam/. Sure, it’s not C++ code, but you could easily port it to C++. Je suis curieux de savoir où en est le projet Paamela, et surtout s’il serait possible d’avoir accès à quelques algorithmes AAM (en particulier le fitting). J’en aurais certainement utilité pour ma thèse de Master. Le projet Paamela est clôt. Je l’utilise actuellement dans des applications commerciales, je ne peux donc pas partager le code pour le moment. Quelles applications sont développées avec ? En tout cas bonne chance pour les projets commerciaux. Do you have the paper of this project that I can study from the paper? I am also planning to implement AAM on my own but unlike you I am an average programmer 🙂 Could you please share your learnings while building Pamela or point me to some resources that would help me in building AAM. I wish I could help you, however I haven’t worked with AAMs for quite a long time now, and my memories of the exact use of Jacobians are quite fuzzy. Hopefully someone else reading your comment will be able to answer you. Thank you very much. I have read some other code and know the Jacobians. The whole algorithm could running, but I noticed something. When the shape converge( error become smallest ), if I continue iterating the loop, the shape will become bad and the error will become larger. According to the paper, when the algorithm converge, the shape will almost not move ( move around the local minimum ). So what’s your situation ? Yes, the algorithm is supposed to converge. And it is also true that convergence is quite unstable in AAMs, and that the algorithm can diverge quite easily. I’ve also had cases of shapes moving around a local minimum, and a rule of thumb is that with good initial conditions, the algorithm will generally converge in at most 10 to 20 iterations. I have another question for helping. My model can fit my trainning data, but can’t fit my face ( I used the MUCT data, it has more than 200 faces). My PCA appearance model can reconstruct my face. So I don’t know why my AAM can’t fit my face. The behavior you’re seeing is expected. The choice between ASMs and AAMs is a tradeoff between precision and generalization. 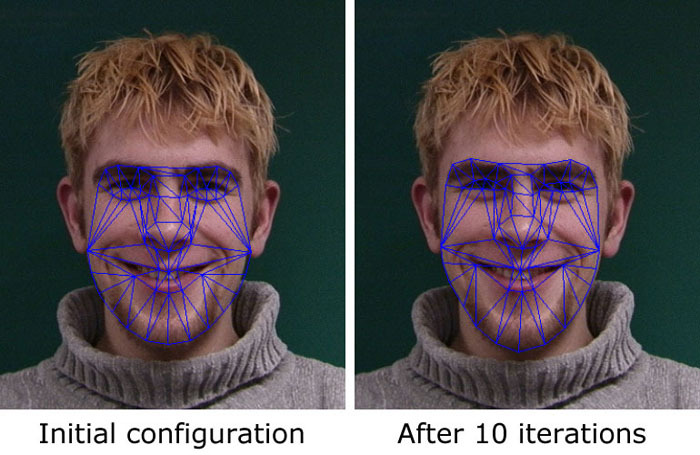 If the goal is to fit a small set of predefined faces, by small I mean 1 to 4 different faces, then training an AAM over a large variation of poses and illuminations of those faces will give better results than with an ASM. This is what you would use for the special effects in a movie for example, building one very precise and separate model for each actor. If the goal is to generalize and detect facial features in new faces in the wild, “new” meaning not in the training set, then an ASM will perform better than an AAM — though it will never be perfect. This is what you would use for building a surveillance system for instance, to be able to fit new faces. Thanks Emmanuel. This post was really helpful. Especially the last comment on when to use ASM or AAM. I am trying to do head pose estimation for “new” faces using ASM with VOSM  library. In ASM, will increasing the number of feature points result in better fit ? Will the increase in features points, take more cpu time/iterations to do the fitting ? Hope using ASM with POSIT for pose estimation is not a bad idea. What really makes a good fit is how well the features have been selected. For a human face, the face contours, the mouth, the nose, the eyes and the eyebrows are a logical choice, because they are segmenting the image naturally. Increasing the number of feature points would increase the accuracy of the fit, but only up to a certain point. Reducing the number of feature points on the contrary would for sure decrease the accuracy of the fit. Most ASM facial models I have seen are using around 80 feature points at key locations around facial features, and I would argue that this is enough for a good fit. However, I have never experimented myself or seen any study of the influence of the number of feature points on the quality of the fit, so that could be an interesting thing to try. As for the CPU requirements, I would expect a model built on more feature points to require more CPU, although how much more CPU would depend greatly on how optimized is the exact implementation. Another way to improve the quality of the fit is to normalize the input images in terms of illumination and contrast so that they match the parameters of the images used to train the model. This is what has worked best for me, unfortunately this is not always possible with ASM fitting faces taken “in the wild”. Is it possible you to send me the download link of Paamela? your introduction about AAM is very interesting: I’m interested in your project, is it possible to take a look to the capabilities of your implementation? I’m planning to develop on my own an AAM lib exploiting my proprietary computer vision library (No OpenCV is desired in my -future- commercial products). For the sake of true the AAM step is necessary even if my project is not related to “faces”. Can you share with me some data (better a binary) to analyze performance of your implementation (I’m worried about cpu-load / frame rate). My target is Windows for a demo, ARM for the market.